I love the change from one season to another, but it is always a little sad for me when summer turns into fall. This may be due to the fact that I am a teacher and get to spend the summers with my son and husband, the fact that I love hot weather, or my hatred of wearing socks. Whatever the reason, on this first day of autumn here are a few of my favorite outfits of the day from summer 2013. 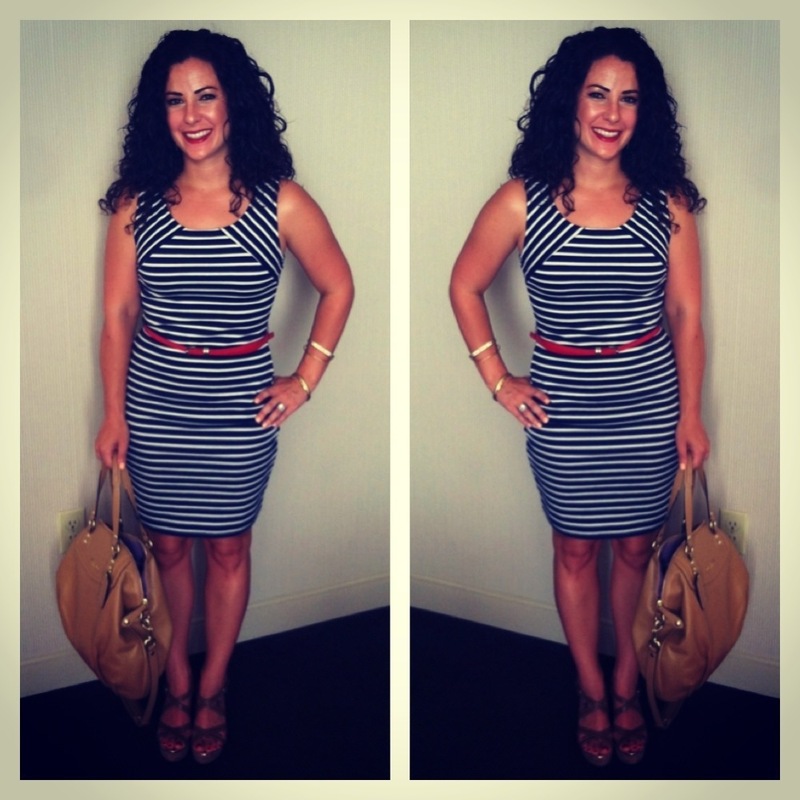 I wore this striped body con dress for my fifth wedding anniversary. My husband and I had a night on the town and lux hotel suite, it was perfect! I found this dress in the juniors department at TJ Maxx for $14.99. I love stripes and the slim red belt with a gold buckle was perfect! 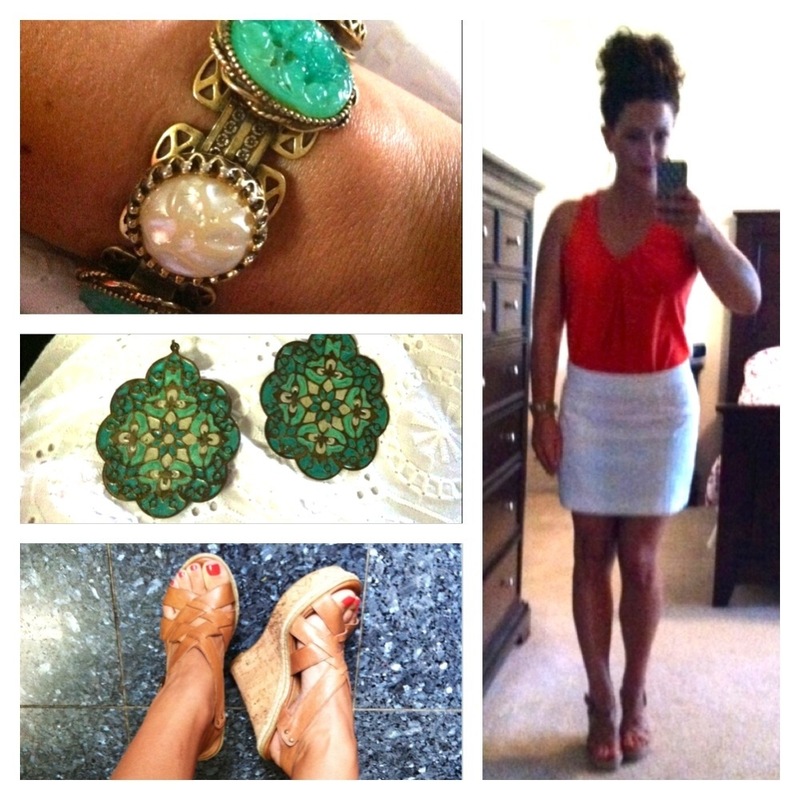 I paired the dress with strappy tan Banana Republic sandals, a tan Coach purse, and gold bangles and earrings. I wore this dress more times than I can count this summer. I found this maxi dress at Ross for $8.99! I wasn’t kidding when I said I love stripes! I find stripes to be so fun and flattering for all figures. A tip my grandma told me when I was a little girl is that smaller stripes make you look smaller! I paired this maxi with thrifted lime green sandals I found at Goodwill for $5, my t+j designs pink bib statement necklace, gold bangles and pave earrings, a great black pebbled leather bag I bought years ago from Forever 21, and my Just Cavali aviators I picked up at Nordstrom Rack for $30! I was hesitant to wear maxi dresses, because I am petite, (5’2 on a good day), I wish I would have jumped on the bandwagon sooner! I feel like maxis are a wardrobe staple, here to stay. Another favorite outfit of mine was this little number. Besides stripes, I have a serious thing for clothes that are coral orange. I’m surprised my friends have staged an intervention! I wore this outfit on a dinner date with my husband. The coral tank is from Banana Republic Factory I think I bought it for $6 last summer. I love this white eyelet skirt! I bought it at the Gap Factory store this spring for something crazy like $7! I paired it with my favorite tan woven Steve Madden wedges, a pair of boho enamel earrings I bought at H&M in college, and a cool bracelet I got from my grandma. I love to have pops of complimentary colors, I think it adds interest to your outfit and is a lot more eye-catching. 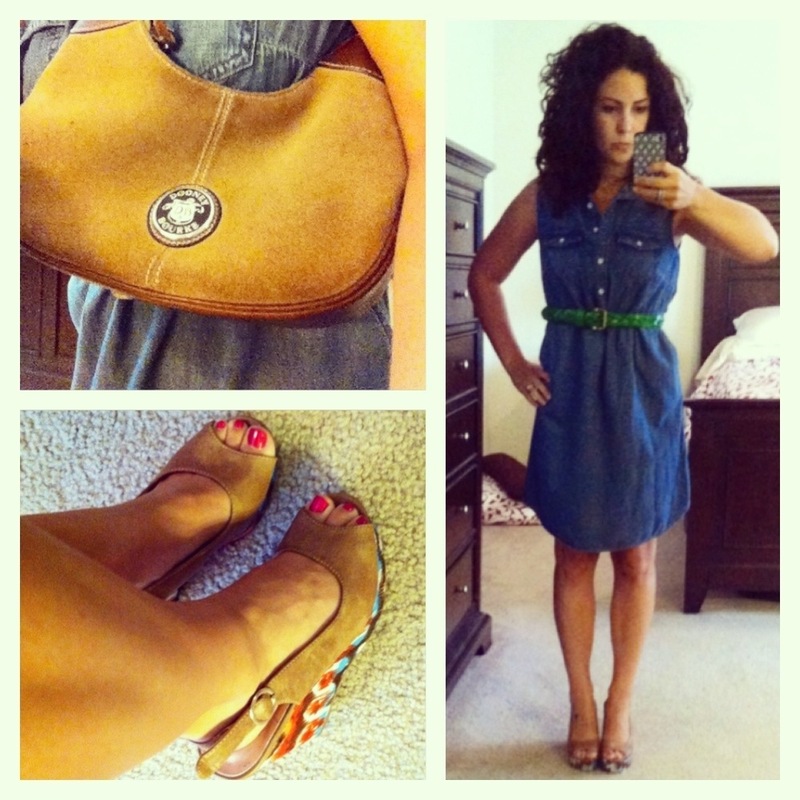 This denim or chambray dress was an amazing find at Target for $12! The waist has drawstrings you can synch to accentuate your waist. Instead of tying the strings in a bow, I tucked them inside the dress and added a green braided belt I thrifted for $2 at Goodwill. I added a fun watercolor pair of Madden Girl sling backs I found at Ross for $20, and a cute Dooney and Bourke hobo bag I thrifted for $5! As much as I will miss wearing sleeveless clothes, sandals, and sundresses; I am looking forward to fall and winter and wearing scarves, sweaters, layering clothes, and boots! You have a sence of fashion! I love how you match clothes and you make the clothes stand out as well. I wish I could buy good items and match them well with an affordable price like you,..!! Do you also sometimes sell your items?